I promised to “have a look” on a piano that did not sound “right” any longer; not for some time. A piano tuning professional had said that he does not know any piano with this name. After opening the piano, it turned out that the manufacturer name is visible only in the inside, and that the outside name is something else. So no wonder the professional did not recognize this piano. 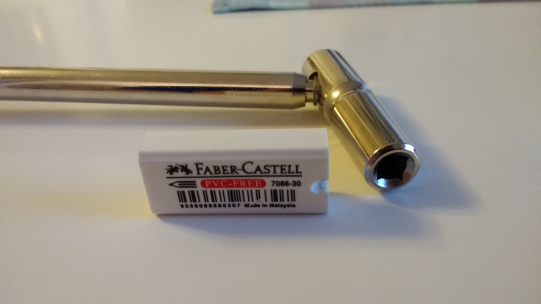 I had already received the piano tuning key from a local music store, and as a good surprise one of the 3 key heads fit nicely to this piano, see photo below. 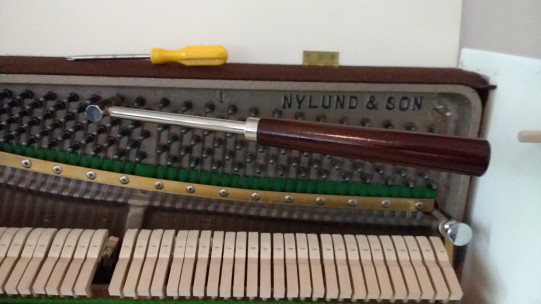 In some pianos, there is an agraffe that is used to guide the strings (see the horizontal metal sheet). After reading the instructions in the Links chapter, it finally was quite straight forward to tune one key. In this piano, each key, on the right hand side of the piano, are connected to 3 strings. Before tuning, it is good to check how much the keys are out of tune, for example with and android application like Pano Tuner. Then in the tuning process, you need to damp the other strings of the same key either by finger or by home made tool (like photo below). This entry was posted in Audio and Video, Basic Tools, DIY, For Fun or Interest, Hobbies and Other Interests, Piano, Tests, Tips, Tools. Bookmark the permalink.